Apple® and China Mobile today announced they have entered into a multi-year agreement to bring iPhone® to the world’s largest mobile network. As part of the agreement, iPhone 5s and iPhone 5c will be available from China Mobile’s expansive network of retail stores as well as Apple retail stores across mainland China beginning on Friday, January 17, 2014. iPhone 5s, the most forward-thinking smartphone in the world and iPhone 5c, the most colorful iPhone yet, will be available for pre-registration from China Mobile’s official website (www.10086.cn) and customer service hotline “10086” beginning on Wednesday, December 25, 2013. The China Mobile iPhone will be a BIG upgrade – and it will only be available in China. There have been reports that there are as many as 45 million iPhones on China Mobile’s network, and every single one of those runs at EDGE speeds thanks to China Mobile’s use of the aforementioned TD-LTE/TD-SCDMA networking. It’s fair to wonder how much customers value LTE>3G, but LTE>Edge is a massive upgrade indeed; all of those 45 million customers are prime candidates for the China Mobile iPhone. Moreover, calling it the “China Mobile iPhone” is not an accident. This is a third version of the iPhone that will only be available for sale in China. There will be no gray market undercutting iPhone sales as is the case for China Unicom and China Telecom. At the very least, this fact alone will provide a nice boost to Apple’s quarterly China numbers. Some on Twitter challenged this assumption, and I backtracked a bit in a follow-up piece I wrote. 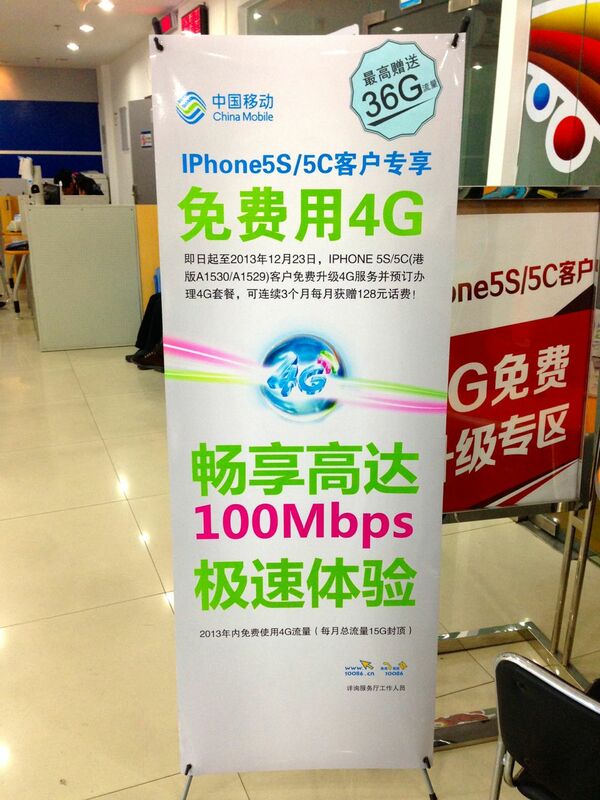 However, a little birdie has told me this is indeed a new set of SKUs that is specific to China Mobile. A sign in a China Mobile store that says 4G service is available for iPhones 5S/5C bought in Hong Kong (Models A1530/A1529). Image from Lawrence Li. However, full coverage requires band 41, and contrary to the Forbes article that I referenced in my follow-up, that does necessitate a new model, not just a baseband upgrade. For those counting, that’s 19 more SKUs. These were from back in September, and were the primary reason I’ve been certain about this deal’s imminent arrival.